The stock market is made up of millions of participants, acting on their own subsets of knowledge and emotion, pushing prices around for a variety of reasons. This group is who we typically define as the “crowd” that we must outthink in order to beat the market. But as any good game theorist will tell you, predicting the markets is not about predicting how the crowd will behave; it’s about predicting how the crowd thinks the crowd will behave. So with the prospect of a trade war ahead of us, made all the more real by Beijing’s imposition of previously announced tariffs on 128 US goods, how do we make heads or tails of the investment landscape? In my opinion, this is one of those situations where investor focus is being redirected with laser-like precision onto a binary event outcome. Movements in the market right now correlate very strongly with developments in the trade war saga – when it looks like talks are progressing, the Industrials are up 500 points, and when it looks like the situation is deteriorating, we see the reverse. You may also like What Is the Data Saying? Add in the influence of algorithmic short-term trend traders and an endless stream of mindless tweets, and you have the perfect recipe for volatility. But just because the water on the surface is choppy doesn’t mean that the currents beneath are turbulent. In fact, if we look beneath the endless stream of anxiety-inducing headlines, we find that the situation may not be as bad as everyone seems to think. 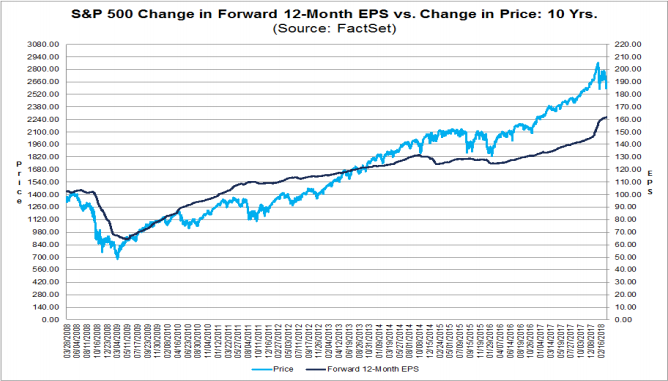 Take recent FactSet data as an example. On December 31st, well before the mess that we’re in started, the estimated earnings growth for Q1 2018 was 11.4%. That’s respectable, but what’s more important is what’s happened since then. Over the course of the last three months, during which the market experienced several heart attacks, earnings estimates have risen for not just a handful of companies, but for ten out of eleven sectors of the market. As of March 29th, the estimated earnings growth rate for the first quarter stood at 17.3%. Those who pay close attention to earnings estimates will immediately recognize this as unusual behavior, but for the rest of you, take a look at the chart below to see why this development is anomalous. During the past five years (20 quarters) the bottom-up EPS estimate has recorded an average decline of 3.9% during the quarter. 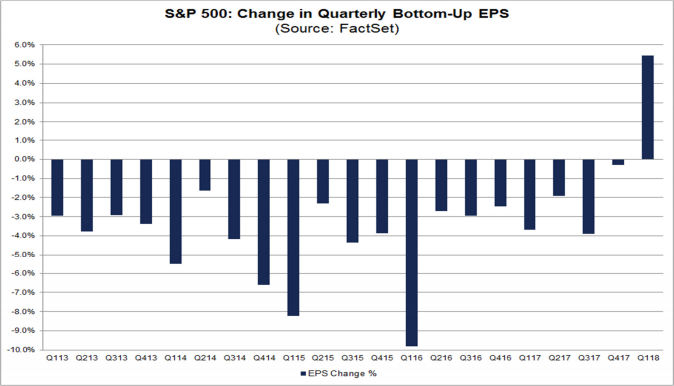 During the past ten years (40 quarters) the bottom-up EPS estimate has recorded an average decline of 5.5% during the quarter. During the past fifteen years (60 quarters) the bottom-up EPS estimate has recorded an average decline of 4.1% during the quarter. Based on this, I think it’s fair to say that there is something positive bubbling beneath the surface on the earnings front. But that’s not all. During the first quarter, we also saw the full-year 2018 earnings estimates increase by 7.1%. Once again, ten of the eleven sectors recorded an increase in their bottom-up estimates for the full year. You can see this increase in the chart below, as the dark blue line. The light blue lines reflect the change in the price of the S&P 500. This chart highlights another key development, which is the compression of P/E ratios. Notice that as forward earnings estimates have increased, the price of the S&P 500 has fallen (okay, you probably didn’t need a chart for that!). The end result is a big drop in the forward P/E ratio, which now stands at 16.1. This level matches the average forward PE that we’ve seen over the last five years. In other words, stocks are currently about as expensive as they’ve been on average since mid-2013. Okay, now here’s how I see this all playing out. Right now, the market narrative has nothing to do with earnings. Nearly every news item you hear involves tariffs and trade wars, data protection, or tech-related concerns. As an example, how many of you are aware that we’re already off to a strong earnings season? So far only 19 of the S&P 500 companies have reported, but 16 of those have reported positive EPS surprises, and 15 have reported positive sales surprises. As earnings season comes closer into view, and we begin to see a shift in the headlines, I think investors are going to once again take note of the strong fundamentals. As they do, I expect it to have a grounding effect on the market and perhaps draw some buyers in off the sidelines. This does not, however, mean that the market has to rally. On the contrary, I think we may continue to tread water until a shimmer of light at the end of the trade war tunnel is visible. But the strong underpinnings of earnings should act to provide something of a floor. As a result, I don’t see the market as being in quite as precarious a position as many. In the short-run, the market is heavily driven by emotion and psychology, but over longer periods of time, it’s driven by economic growth and corporate profits. As fundamentals come back into view, it should help to reorient investors. But that by itself will not push the market back to new highs. For that, I think we will need to see some type of major indication that trade tensions are abating. Only then will the current hostage situation come to an end.